Ten people have been killed and 15 injured after a man drove a van into pedestrians in Toronto, police said. The suspect has been named by police as Alek Minassian, 25. A man was arrested several streets away following a tense standoff with officers on the street. Bystander videos appeared to show the driver pointing an object at the officers, who could be heard shouting at him to get down. The man was then detained without any shots being fired. Toronto deputy police chief Peter Yuen asked for witnesses to come forward and said there would be "a long investigation". He said separate hotlines had been set up for victims' families and for witnesses. 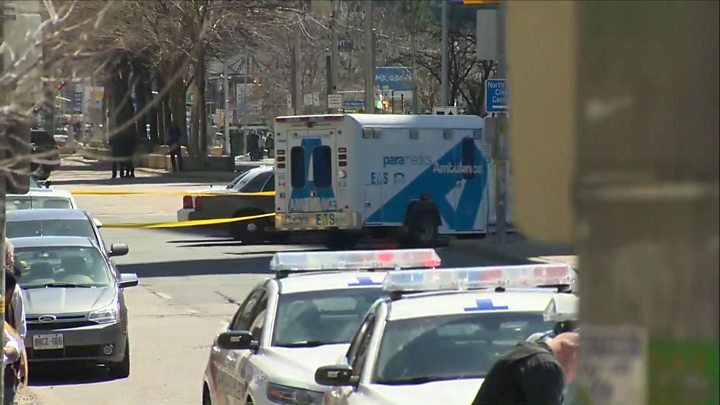 City police chief Mark Saunders told a news conference that the incident appeared to be deliberate but the motive was still unknown. He said Alek Minassian, from the Toronto suburb of Richmond Hill, was not previously known to them. Canadian public safety minister Ralph Goodale, in a tweet thanking the emergency services, referred to the incident as a "horrific attack". He said the white rental van had repeatedly mounted the pavement and run into people. 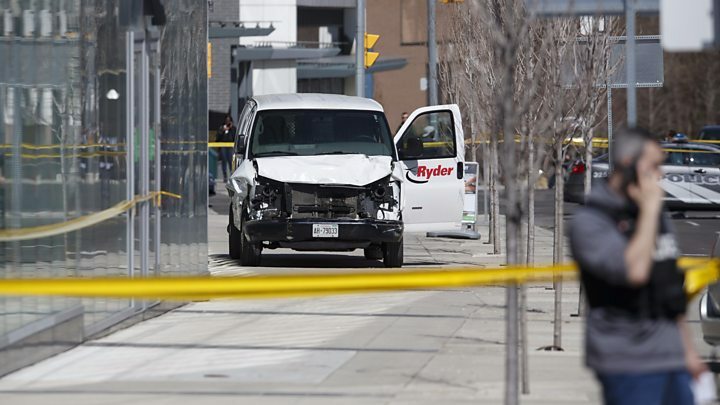 The incident occurred at Yonge Street and Finch Avenue at 13:30 local time (17:30 GMT) on Monday. The crime scene encompassed a an over 1km (0.6 mile) stretch of Yonge Street. About 18 miles (30km) away in the city centre, foreign ministers of the G7 leading industrialised nations - Canada, the US, Britain, France, Germany, Italy and Japan - were holding meetings. Pictures apparently taken at the scene showed armed police and paramedics treating the injured. One orange bag, which appeared to contain a body, was loaded on to an ambulance. Toronto police spokeswoman Jenifferjit Sidhu told CBC News that the vehicle was stopped by police. A long stretch of Yonge Street in Toronto's North York is cordoned off with yellow police tape for what police say will be a complex investigation. There are multiple sites where people were hit. At one intersection, debris and a lone shoe mark the spot of one fatality. In the aftermath, people who would usually be running errands or heading back to surrounding office towers and condominiums reacted with shock at what happened, sharing what they had seen or heard, even though reasons behind the incident remain unclear. Hours after the event there is mainly just quiet, as police begin the painstaking work of piecing together what happened on a wide stretch of road on Monday lunch hour. Canadian Prime Minister Justin Trudeau tweeted from Ottawa: "Our thoughts are with all those affected by the terrible incident at Yonge and Finch in Toronto." "Thank you to the first responders working at the scene - we're monitoring the situation closely." Toronto Mayor John Tory called it "a very tragic incident" that was "not representative of how we live or who we are". He said he had "offered any and all assistance that the city can provide to the police to help this investigation". The US and Europe have seen an increase in driving attacks in recent years. In October 2017, a man in New York drove a van down a bicycle path, killing eight people.